APTIM has performed thousands of Military Munitions Response Program (MMRP) and Chemical Warfare Materials (CWM) projects at former ranges, base realignment and closure (BRAC) locations, and active Department of Defense (DOD) installations. Our highly skilled staff of munitions and explosives of concern (MEC) professionals, geophysicists, environmental scientists, and GIS engineers incorporate innovative technology with advanced instrumentation and classification techniques to safely and effectively investigate, analyze, and clear land and waterborne MEC and CWM. 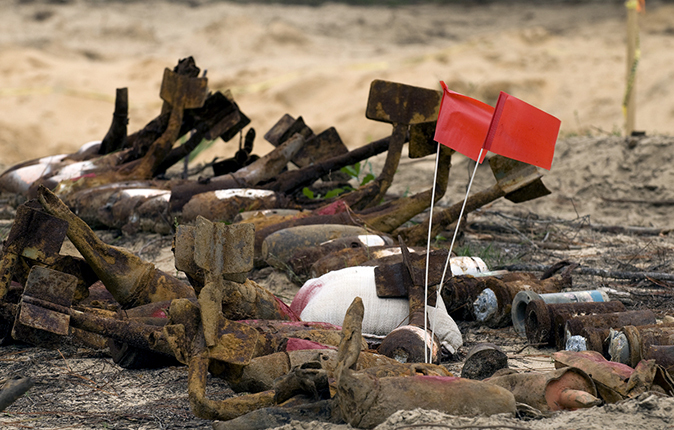 APTIM supports the military’s objective to restore facilities for other use, including recycling, destruction of chemical warfare material (CWM), assessment and disposal of recovered munitions, providing further treatment of byproducts, and identifying waste disposal facilities. We use technologies, such as aerial geophysics, to delineate potential buried munitions in remote test ranges. In addition, we were recently accredited to perform Advanced Geophysical Classification surveys, a technique to detect and characterize underground ordnance.